One of the reasons that Shonda Rhimes’s shows are underrated by the high-brow-set is because their moral ambiguity and deeply complex characters sit uncomfortably beside melodramatic plotting and a wildly pulpy tone. Rhimes has mixed a very delicate cocktail of darkness and fizziness: Some admire the audacity of that, while others are (perhaps understandably) offended that she would whip those two together. I’ve said before that the real difference between art and entertainment is that the latter is concerned with intended consequences (think “CSI” and “House”) and the former with unintended (and ironic) consequences (think “Mad Men” and “Breaking Bad”). So which is “Scandal”? As usual, Rhimes is determined to be both. The storylines in the pilot have deeply ironic relationships to each other. In one, she has to convince a conservative hero to come out as gay to confirm his alibi at the time of a murder. In the other, she threatens the president’s mistress with humiliation if she comes forward. If these two storylines were simply juxtaposed, it would feel darker and more ironic, making it more of an arty show, but the show is lifted back up into the realm of entertainment because one finale triggers the other: It’s only after confronting the president that she’s able to tell the war hero what he needs to hear. So Olivia has restored a chain of intended consequences (she resolves the case-of-the-week thanks to what she learned from the ongoing story), but she does so using a deeply ironic “inspirational” speech that’s actually borne of her own self-loathing and chaotic downward spiral. Olivia tries to harness the irony of her life in order to keep control, but it’s obvious that she’s not really succeeding. In other words, it’s a volatile mix of art and entertainment, and that friction actually deepens the show. In other hands, this would be an unstable template for an ongoing series, but it’s right where Rhimes wants to be. I’ve written about how it’s always best to differentiate an ensemble using their current actions and attitudes, rather than by giving them “interesting” backstories. This is one of many aspect of TV writing that Shonda Rhimes has mastered. 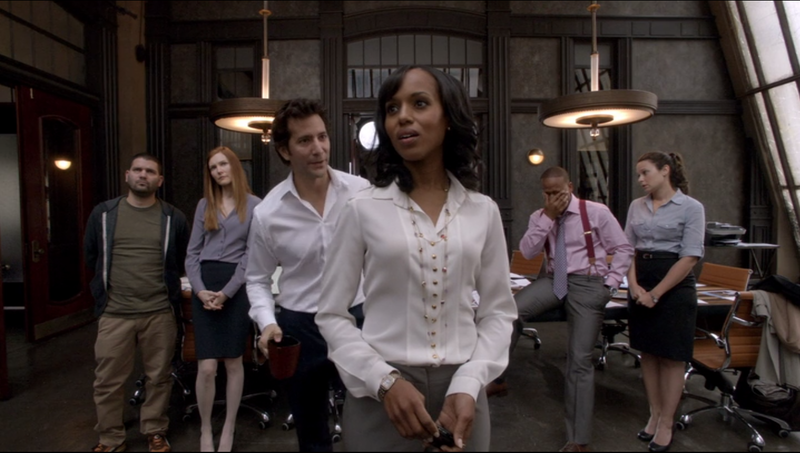 In the script for the “Scandal” pilot, there are scenes in which the team members talk about their backstories, but by the time the episode made it to the screen, those scenes had fallen out, because they were no longer needed. Stephen: I vote no. The guy's a fugitive covered in blood. Not once did he question who killed Paige or ask us to find her killer. We all know that's a red flag. He did it. Harrison: No, I don't think he did. He's a soldier, government-issue trained killing machine. He'd have to be an idiot to get her blood all over himself, call 9-1-1, and then run. But I still vote no. It's a media hand grenade. Abby: I don't want to take it because it's too messy, too much work. And I hate republicans. Olivia: My vote always comes down to my gut. My gut tells me everything I need to know. We're taking the case. Stephen: Why do we even bother voting? Almost instantly, we are able to differentiate between the ensemble’s attitudes and agendas, with no backstories necessary. It builds up conflict for later, in terms of simmering resentments and prejudiced viewpoints. Of course, the downside of this particular vote is that one of the show’s top assets, “Lost” vet Henry Ian Cusick (Stephen), left the show without a word at the end of the first seven-episode season: He had seen the pecking order and he didn’t like it. Ultimately, he decided that Rhimes and Olivia felt the same way: He was a pretty face and a big name that would please ABC, but would never be a match for the lead character. As with some of the other shows we’ve looked at, this is a show that tends to sacrifice the ensemble to empower the hero, and it suffered a bit for that before it found a new equilibrium. Olivia Pope runs a media-relations-focused law firm for scandal-plagued D.C. power players. In the pilot, new girl Quinn gets trained in by smooth operator Harrison and meets sarcastic Abby, lothario Stephen, and quiet Huck. The main story involves a medal of honor winner (Sully) who didn’t kill his girlfriend, but can’t prove it without admitting that he’s gay. In the other story, President Fitz Grant uses Olivia to silence a woman (Amanda Tanner) who claims to be his lover, but Olivia realizes that the woman is telling the truth, because Olivia also had an affair with Fitz and he used the same pet-name. Olivia decides to represent Amanda, setting up the season arc. Well, it’s pretty original (soap, lawyer, political thriller), but it satisfies the expectations of each of these. It’s a very original setting, so it doesn’t need a unique point of view. The relationships within the firm are pretty standard, but then we get a big new relationship: a black woman fixer pursued by a white guy Republican president! Nope, we’ve never seen that one before. Lawyers who never enter the courtroom. A scandal fixer who can’t stop herself from creating the biggest scandal of all. Yes, we see that they can use their powers for both good and evil, and they’ll try to stay on the side of good, though they’ll lie to themselves a lot about that. Yes, it’s made clear that you’re not allowed to date any one or not know anything, or cry long as you’re there. Yes and no. It will be almost entirely about rich people, but there will just enough poor people. Yes and no. Mostly cerebral, just a little physical. Yes, we find this out at the end when she takes on the president. Yes, there will also be a case of the week every week. The big revelation to the audience only: She had an affair with the president in the past. Escalation for future episodes: She takes on the president. Oddball: She’s giving Stephen relationship advice while casually talking about how they’re about to confront Ukranian gangsters and break a deal with them. The ultimate fixer. Everybody gasps when they hear her name. She’s kind of a mess. She has many explicit rules: Don’t lie. No crying. I always trust my gut. She breaks all three of those rules by the end, which lets us know that this will be a deeply hypocritical heroine, and yet we still like her, because we’re hypocrites. Flusters you, then drops overwhelming leverage. And extreme eye contact. She’s addicted to power (romantically and otherwise) and she’s morally and legally slippery. Very much: she solves scandals but can’t keep herself from causing new ones. She great at wielding and manipulating power. Not really. Most of her employees are sort of mini-versions of her, just less so. (I suspect that this is why Henry Cusick bailed after the short first season: he wasn’t allowed to distinguish himself.) In fact, her employees are actually better at following her rules than she is: Quinn actually can trust her gut. Yes and no. She tries not to be about certain things, but she can’t resist. Yes, she has unique pull and unique relationships. Yes and no: they got Cusick but lost him. 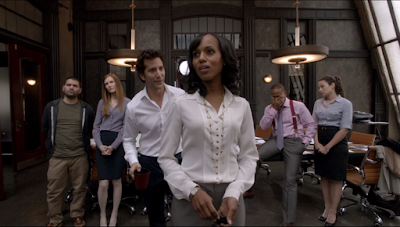 Ultimately, Olivia’s team was downplayed and the presidential politics were played up, partially because they got better actors on that side. Well, not great but good. Yes and no: they’re distinct but not defensible: They all vote down the case for different reasons, but they then fail to defend those points of view and instantly knuckle under. Only Quinn manages to change her mind about something. Yes, we don’t get backstories yet, except a brief mention of Huck’s CIA past. Their backstories will become much richer (and more ludicrous) later, but for now they’re defined by their actions and reactions to this case. Yes and no. Though they insist that they’re serving good, they all know deep down that they aren’t for much of the time. It’s very impressive that they admit at the end that they don’t care who really did it because they’re just representing their client, but even there, they characters aren’t prioritizing their own wants. It’s all about Olivia’s wants. Olivia and the president do, of course, and the other do when out in the field. Yes, they keep shutting her out. Vaguely: Stephen and Abby =gut, Quinn and Huck= heart, Harrison and Olivia = head. Well, Olivia herself basically qualifies, but if we don’t count her…they try with Abby, but the actress doesn’t create enough sparks, so they put Cyrus in this role in future episodes (and Mellie, to a certain extent), and that worked better. 1st act out: Bleeding soldier comes in. 2nd act out: “You tell the president of the United States to make time.” 3rd act out: Demolishes accuser. 4th act out: Suicide attempt. Yes, most episodes will take place within 24 hours, to get out ahead of the scandal. Sort of. The mistress storyline should take place over a longer time frame than the murder storyline, but it’s just believable enough. It has a complete stand-alone story. Rhimes is very good at conflating character and plot. It’s chock full of plot, but most of the plot twists connect either directly or thematically to Olivia’s inner turmoil, so it’s fine. Yes, get the baby back from the Ukrainians. Yes, the guy walks in the door. Yes, after a bit of debate. Not really unforeseen, but I’ll count it: the D.A. isn’t happy and Abby is disgusted by their client. Solider storyline: Try to prove his alibi, President storyline: Try to threaten her away. Soldier: (just a mild one) Gun matches his. President: Accuser attempt suicide. Soldier: Try new methods. President: Watch her full time. Soldier: They find alibi proof, but it’s video of him kissing another man. 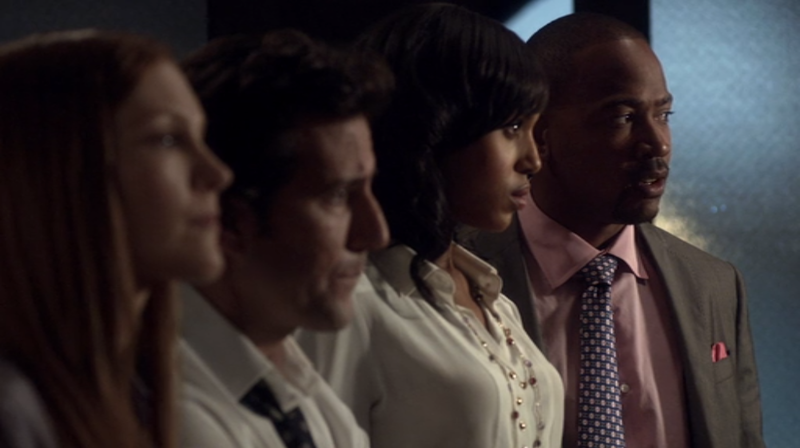 President: Olivia actually listens to the accuser. Soldier: They try to convince him to come out. President: Olivia confronts the president. Yes, soldier comes out. Olivia admits to herself that her feelings for the president have comprised her judgment and morality. Soldier refuses to name his lover, then he does. PART 5: IS EACH SCENE THE BEST IT CAN BE? (19/23) (After being humiliated by Olivia, the president’s accuser attempts suicide. Quinn waits in the hospital and then briefs Olivia. Before the commercial break, we saw Quinn’s discomfort before and then her horror at the news. Somewhat. They spying on someone at a hospital. Olivia doesn’t intend to have the second half of the conversation, and Quinn has to call after her to detain her. We suddenly suspect much more strongly that Olivia had an affair with the president, and we get to see another side of her. Quinn wants to change Olivia’s mind. Surface: what do we do about this suicidal woman? Suppressed: What is our relationship? Are you a good person or not? What’s really going on with you? Can anyone trust their gut? Etc. First inform Olivia, then make the case for the accuser. Olivia storms off to barge into the Oval Office. Quinn pleading does no good, until she says the one thing that would change Olivia’s mind without realizing it. Did they really have an affair? What was the message that the accuser wanted to send? What will Olivia do? What really happened between her and the president. Implied question: Where’s she going. Then we cut to the White House. Ultimately, yes. At times, the show teeters on the brink of Sorkin-disease, in which all non-stars are weak strawmen who collapse in defeat when blow away by the heroes’ brilliance, but each of their opponents eventually gets his or her own. Yes, it turns out that she has a big blind spot. Yes. They’re constantly lying to themselves about their feelings. Many things are said in code. No. Everybody speaks very clearly in Rhimes shows. There’s no cultural specificity here. Everyone is totally deracialized in the pilot, though that will change. Yes and no. There are lots of long eloquent speeches, but Rhimes knows how to break up long thoughts into a series of short, rousing, rhythmic sentences that doesn’t sound convoluted. Yes, the oval office scene. It’s an odd and somewhat uncomfortable mix of soap / lawyer show / political show, and eventually spy show, though that isn’t yet obvious in the pilot. The show didn’t really take off until the second season when it become primarily a political thriller. Yes, addiction to powerful bad boys becomes a black woman’s affair with a white Republican president. Yes: the stand-alone story is a straight-up heroic narrative about protecting an innocent man. The serialized story is much more morally murky. Yes, when they face down the gangster: There is mortal danger involved. Shortly afterwards, when Sully looks guilty, we get moral danger as well. Yes, the subtly prepare us for the fact that we won’t ever find out who killed the girlfriend. It’s answered a little early when he’s arrested (giving Olivia time to move on to the B plot), then she comes back and springs him after all in the final act. There’s a false one early on: “We all get paid crap salaries because we’re the good guys.” and “Because that’s what you are when you work for Olivia: a gladiator in a suit.” But when she arrives, they laugh: “Did Harrison feed you a line about being a gladiator in a suit?” Later, he comes clean: “the reason we're not a law firm is we don't have to play within the rules of the law. We're fixers, crisis managers. We make the problems of our client, big or small, go away. It's not about solving a crime. It's not about justice. It's about our client.” Everything is slippery on this show. Constantly. Pay a kidnapper to get your son back? Protect your client by lying to the cops? Threaten an accuser if you think she’s lying? Very much so. Olivia realizes at the end that she is living a lie just like Sully, and she can talk him out of it but not herself. It’s everywhere. Unseen video surveillance plays in both storylines, etc. Very much so. This will be a “defense lawyer” show that won’t shy away from the intense moral dilemmas of the job. Yes and no. In some ways, it’s very realistic (lawyers not going to court, protecting the 1% to ludicrous extremes, etc.) but there’s no shortage of “the world doesn’t work that way” howlers. For instance: the D.A. agrees to wait outside her door for 40 minutes while she tries to find new evidence! Rhimes’s respect for how the world works fluctuates wildly. Yes. Many of the unique details about law and the halls of power ring true. Very much so: Gays in the military, cheating politicians, many more. Yes and no. The “issue of the week” will usually be presented in a complex and non-hypocritical way. As for the firm, the show will hypocritically twist things so that their machinations wind up serving justice, allowing us to be shocked at their bad ethics while reassuring us that nothing really bad happens as a result. Yes: the kidnappers get away, the real murderer is uncaught, lives are destroyed. She synthesizes it, but she does it in the speech to Sully, so it’s sublimated and motivated, so that’s okay. Yes, Sully can come out, but she can’t without wrecking the country and her career.